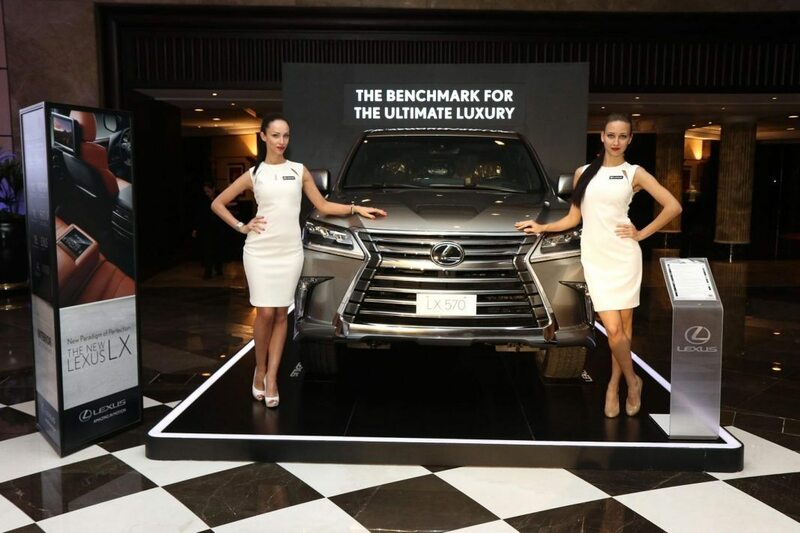 Ebrahim K. Kanoo, the sole distributor of Lexus in the Kingdom of Bahrain, unveiled the new 2016 Lexus LX 570 during an exquisite event on Saturday November 14, 2015 at the Ritz-Carlton, Bahrain Hotel & Spa. This prestigious event gathered the top officials from private and public sectors, as well as Lexus customers and members of the media. Lexus Bahrain took the wraps off the new 2016 LX 570, unveiling a premium, full-capability three-row luxury utility vehicle that combines the brute strength of a massive V8 with the grace of an eight-speed automatic transmission. Lexus left barely any surface of the LX 570 untouched in a sweeping upgrade for 2016. The restyled front end wears an even bolder rendition of the Lexus signature spindle grille, framed by elegant satin chrome trim and complemented by distinctive new standard LED headlights, turn signals and fog lights. The upgrades for 2016 however go beyond skin-deep. An eight-speed automatic transmission replaces the former six-speed for enhanced performance and efficiency. Additionally, a new driving mode called Customize Mode helps the LX achieve extremely stable and adaptive performance both on and off the road. To further increase safety and peace of mind, the LX is available with the Lexus Safety System+. The exterior of the 2016 Lexus LX combines the power of an SUV with the inherent luxury befitting a Lexus flagship. The front profile provides a sense of stability with its daringly muscular lower portion, while the side profile emphasizes a refined yet bold and dynamic under body and the rear cuts a sturdy yet graceful outline. The spindle grille projects a sense of strength and elegance, and symbolizes the ever-evolving nature of Lexus. Sequential LED turn signal lamps are utilized in a Lexus vehicle for the first time. Also available from Lexus for the first time are 21-inch aluminium wheels. The 2016 Lexus LX will be available in 7 exterior colours, including two new colours; Sonic Titanium and Deep Blue Metallic. A new interior atmosphere has been created by separating the display zone from the operation zone and incorporating remote operation devices such as the Remote Touch Interface. The new, larger 12.3-inch navigation screen helps aid the driver, while a larger, 4.2-inch TFT multi-information display screen has been installed on the new, high-visibility Optitron metre. The LX 570 puts more information directly into the driver’s line of sight with the newly available Head-up Display (HUD). The 2016 LX 570 is designed to please passengers. The Rear Seat Entertainment System uses dual 11.6-inch screens. The luxury touches continue with the Lexus-exclusive Mark Levinson Reference Surround Sound Audio System equipped with 19-speakers and navigation system. In addition to the 4-zone independent automatic temperature control, Lexus Climate Concierge meticulously controls the seat and steering wheel heaters. In terms of the front seats, a 10-way power seat for the driver along with an 8-way power seat for the passenger is available. The Lexus LX 570’s formidable 5.7-litre V8 engine produces 362 horsepower mated with a super intelligent, electronically controlled eight-speed automatic transmission, and demonstrates easy acceleration on-road and ample power at low and medium speeds off-road. The outstanding performance of the LX 570 comes courtesy of the following features: Handling is improved by virtue of Variable Gear Ratio Steering (VGRS). The newly available Drive Mode Select allows the LX 570 driver to tailor powertrain and suspension responses by selecting drive modes suitable for the situation; modes include NORMAL; ECO; COMFORT; SPORT S; SPORT S+. A Customize Mode has been included for the first time among the drive mode settings on a Lexus to enable the driver to select a driving mode better suited to his or her preferences. To complement the Drive Mode Select switch, the LX is equipped with 4-Wheel Active Height Control (AHC) suspension, which automatically controls vehicle height in various situations. In addition, AVS automatically adjusts the attenuation force of the suspension to suit the prevailing driving conditions. The LX’s Crawl Control feature provides optimum throttle and brake modulation when manoeuvring over rough, uneven or difficult terrain. The Multi-Terrain Select switch increases AWD performance by optimizing traction and brake control. The LX also scores highly when it comes to offering comprehensive protection for passengers. Ten standard airbags are among the comprehensive occupant protection measures in the LX 570, which features a wide array of advanced safety technologies integrated into the Lexus Safety System+. These include the following technologies: Pre-Collision System (PCS), Lane Departure Alert (LDA), Adaptive Hi-beam System, and All-Speed Dynamic Radar Cruise Control. The LX is also equipped with Multi-terrain Monitors, a system of four cameras that monitor conditions around the vehicle. In addition, as a Lexus first, the LX features an under-floor view that allows the driver to check both conditions under the vehicle and tyre positions while driving off-road. A full-size, premium SUV designed to take refinement to places it has never been before, the new LX packs in the comfort, luxury and infotainment technology expected from a Lexus flagship model. Visit the Lexus showroom to explore the 2016 Lexus LX 570, call 17737773, or www.lexus.com.bh for more information.